I debuted my Player Tracking Plus Minus here last year as a Beta stat. Basically I have never stopped making changes and already put out one update on Nylon Calculus. In terms of writing I try to find a balance between writing up every little finding, for whomever is actually interested, and just holding on to the end. My plan is to wait for the end of this season, sadly less than twenty games away to do a full 2.0 version. That will give me a better target variable in terms of reliability from last year and not have to worry about synchronizing any data updates from the different source I am using. But the defensive side is the most interesting and I thought I'd put some of the prep work out there in order to clarify my own thoughts and get any feedback. As I alluded to in my fouling rate model the other day. I have been adding the specific foul data via NBA Miner to the model, and it appears to be a big improvement. The two specific foul types that consistently show value in cross validation are offensive fouls drawn as a positive and shooting fouls as a negative. Happily these are nice common sense terms that any basketball coach would recognize; defend without fouling and beat the offensive player to their spots. The general term for offensive fouls dawn, which includes charges as a subset, is +1.26 per offensive foul drawn per 40 minutes. That is a high figure, higher than steals for example. So it's important to keep in mind what a orthogonal RAPM derived model is trying to do, which is to determine an estimate of player value not a description directly of the value of each play. Sometimes a model will pick up an attribute that seems to be associated with good or bad players, and may, in fact, act partially as a proxy for other actions not seen in the model. This is especially true on defense, where our data is fairly limited. Blocks, prior to SportVU data, have been a proxy for rim protection, a decent, but flawed one. Steals in draft model especially have acted as proxies for spacial awareness and defensive engagement. Here I think that offensive fouls drawn act as a proxy for physicality on defense and defensive anticipation. Another interesting note is that there is no other term in the model with a strong direct correlation to drawing offensive fouls, so there is definitely some independent information being conveyed by a player's ability to draw offensive fouls, however that ability is interpreted. Contesting three point shooting is noisy business, with little year over year relationship in the results, as I found here. And showing a coin flip like pattern in the results. Defending shots within the three point arc is still noisy, but there also seems to be some signal. So, for that reason I have used the percent plus minus on two point shots contested by the player. Even though including all shots improves in sample correlation to this year's defensive RAPM more, it is less likely to help predict next year's performance. Lastly, the NBA version of defensive rating (DRTG), which is a descriptive statistic of how the team performed with the player on the floor, is used in as a second stage variable on the residual of the individual defensive statistics model. I have used that technique for a while, the good thing about this method is that it allows me to pick up the information from individual performance without being overwhelmed by correlation between DRTG and defensive RAPM, then allows me gleen the additional information from team performance rather than throwing that information away. It is also an improvement over using over all team performance that includes defensive performance when the player isn't even on the court. One good piece of news is that the DRTG effect is just over two thirds of what it was in the older version with the new information added, so the model is able to attribute a bit more value to the discreet actions of the player. My player updates at Nylon this year will continue to use the PT-PM as developed earlier, since it is confusing to change both the metric and the input data at the same time. But next year I will unleash the power of this fully operational player metric. It's about that time of year; football is entering mid-season, baseball is wrapping up, lattes are being Pumpkin Spiced and the NBA is finally about to start. That also means that numbers guys are crunching numbers to project the results before they happen. Last year I did my part with a series of what I dubbed Highly Plausible Win Projections using a couple of different player metrics to estimate wins for the NBA. This year I am using an exploratory player metric I created using publicly released SportVu data called Player Tracking Plus Minus (PT-PM) blended with RAPM and will follow up with another projection using ASPM Daniel Myers' boxscore based player metric. PT-PM was developed using a combination of box score stats and SportVu stats regressed against RAPM data. Due to the newness of SportVu data, starting publicly only last year, data was limited. So I concentrated on building a stable model rather than over-fitting risking adjustments with unstable relationships, as a consequence the model leans towards mean reversion. The ESPN model, for example, has four teams in the West projected at over 60 wins using RPM. The PT-PM model, on the other hand, has seven western conference teams with over 50 wins. The ASPM projections use two years of data weighted to the most recent year, which should give that model something of an advantage. Both models apply an aging factor and then run the numbers through the schedule with odds of winning calculated for each game, factoring in home court advantage. Huge shout out to Kevin Ferrigan for providing me with his roster minute projections to start my analysis. I then made some of my own alterations, like to account for the momentous Joel Anthony-Will Bynum trade and the almost as important Kevin Durant injury. Minute projections are perhaps an underrated part of season projections, most of the methods used end up straddling the line between how much the coach would actually like to play his starters and the injury risks that end up striking somewhere every season. Finally, to the numbers. Below both win projections are shown ranked via PT-PM in conference. They have generally less of a consensus on the Eastern conference. PT-PM likes Miami considerably more than ASPM, specifically PT-PM like Mario Chalmers and dislikes Norris Cole less than ASPM. Some of that maybe the plus/minus DNA showing, I am not convinced that Miami won't have a bigger regression than that with the best player in the league gone. ASPM is still high on Detroit, that comes mainly from loving Andre Drummond, who scores a +2.97 in ASPM but has been rated more neutrally in plus/minus derivations. In the west playoff teams from last year look solid, save perhaps Portland. Kobe Bryant still scores decently in a two year ASPM since his disastrous minutes last year were so few, lifting Lakers perhaps unreasonably high. 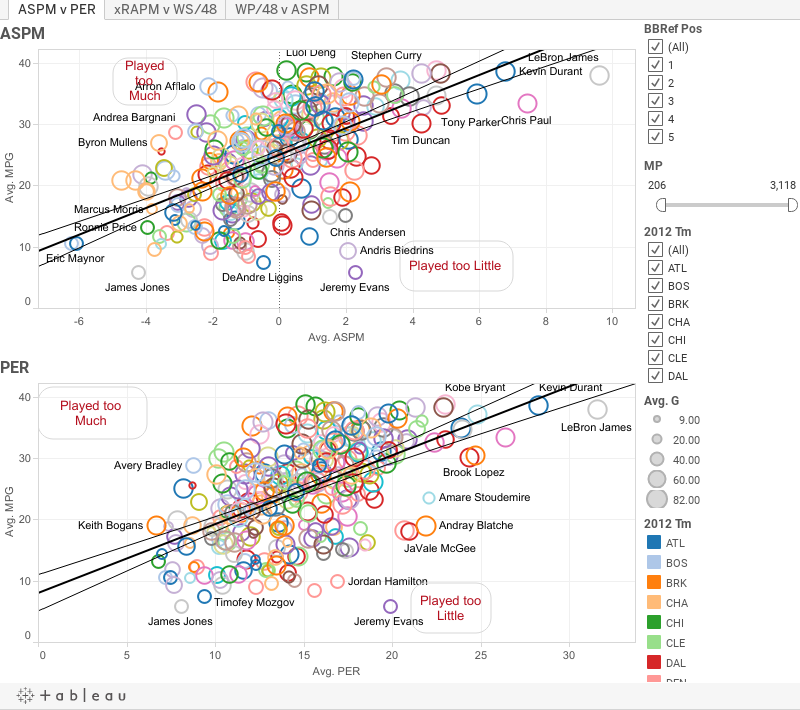 Player Tracking Plus Minus (PT-PM) is a player metric based on a WLS model against stabilized Plus Minus (RAPM) scores of NBA players last year using a combination of traditional box score data and publicly released SportVu data. This is a beta version, meaning it is still in development. Because what the world needs now is another all in one basketball player metric. Ultimately to try to better understand the game of basketball. Though given that there is only one year of league wide data, this is only an exploratory analysis. For fun. People like rankings, they're the #1 click bait generator on the internet1. Hypothetically, if I was sitting home with a merged copy of SportVu player tracking data with box score data and possessions, how would I calculate it? RAPM is split into offense and defense in terms of estimates of a player's impact on the floor, so I used the two scores to perform two separate regressions weighted by the number of possessions on the court for each player, using box score data and SportVu from NBA.com and RAPM from Jerry Engelmann's Stat's for the NBA. Passing Efficiency is a SportVu derived metric that I detailed here, it measures the points created per pass attempts, it could also be thought of as Passing Effectiveness. TOV per 100 touches (TOVtouch100) is another SportVu derived metric that measures the number of turn overs committed per 100 touches of the ball. I went into that one in more detail here and here for the Celtics last year. There are a couple of potential take aways from this study, I think. Passing Efficiency was consistently more important than assist count in every random sub-sample run for regression and using a couple of different statistical filters, indicating that it gives a better measure of passing creativity and effective "ball movement" than the traditional measure. The distance between TOVtouch100 and simple turnover count per team possession was smaller, though consistent, indicating that the additional control for touches is adding some context to the player's role not captured by other variables in the regression. Finally, Contested Rebound Pct, I found last year that contested rebounds were mostly offensive, so it's not a surprise that this measure showed up as significant. It was a surprise that the relationship without respect to rebound count proved to be so consistently a better indicator than offensive rebounds. The analysis may be picking up some 'hustle and grit' vibe from this, though I think there needs to be further study on this one. I also performed a WLS on the defensive RAPM score for each player. As is often the case, the data available gives a weaker fitting model than on the offensive side of the ball. But there was some indication of real explanatory power from the rim protection data from SportVu. In the end I chose to go with a more parsimonious, but stable, model. The number of blocks a player has doesn't appear to be important once we have the SportVu rim protection data. In the formula OpponentFG%Rim is the percentage a players opponent shot at the basket when they were in position to contest the shot, the higher the opponent's shot percentage the less effective the player is on defense. The other SportVu related factor OppFGARim, is the number of times per 100 possessions the player was in position to contest a shot at the rim. The more they were in a position to contest the better. Ok, where's the list? Pretty sure I was promised a list. Sure, keeping in mind that this is a beta version. The defensive model, especially, is underpowered, but here it goes. Below is the top 20 players with their Player Tracking Plus Minus scores and the original RAPM scores. Notice that LeBron James is at the top with Kevin Durant and Chris Paul are on top so our priors are at least satisfied. A couple of the more surprising names this high up include Eric Bledsoe, who was listed as one of the best defenders in game by RAPM last year. Bledsoe was the best at protecting the rim among back court players last year. Also, Brook Lopez was surprisingly effect and active protecting the rim in the brief time he was healthy last year. For all of the new metrics it is a real question how consistent players results will be year to year. Rim protection seems like it is particularly apt for variance, as defensive measures tend to have high variance in basketball. Needless to say there's more work to do on this. Some of the issues I want to look at include exploring positional issues, looking at team and line-up data relationships, and turning it into a predictive measure. This is pretty inside baseball, as they say. But there's been some interest in the European League strength that I have been looking at as a part of my draft model building. So, I thought I'd share the latest work I have done on it. I am only looking at the leagues tracked in the DraftExpress database, which covers the most of the major prospects that are drawing interest for this year's draft. Leagues tracked there are the transnational Euro League and Euro Cup, as well as the Spanish ACB, Italian, Adriatic, French and Greek leagues. That leaves the Turkish and Russian VTB out along with some less prominent leagues like the German, Polish and Belgian leagues. The Euroleague and Euro Cup are the keys to being able to draw comparisons between leagues since teams and players will play in both the international and domestic leagues during the same season. That gives me a good number players facing competition in both. Again the basic logic is that players facing more difficult level of competition will perform less efficiently than against less skiled or athletic players, which is pretty basic and not terribly controversial. As I did in both the D-League/NCAA and D-League/Europe comparison I used the Alternative Win Score (AWS), a linear boxscore metric, to measure the player's relative performance in each league. Against inferior competition any player with be able to rack up better stats, score more efficiently, gather more rebounds, steals, and likely commit fewer fouls. When a group of players suffer a fall in production when changing leagues, as NCAA players do when playing pro in Europe then we can infer that they are facing tougher competition. Below are the results of the median change in efficiency looking at players playing in both one of the domestic leagues and one of the larger leagues over the last two years by league. To interpret that table a bit, the Adriatic, Greek, and Italian league are overall close to as competitve as the Eurocup league. While the the Spanish ACB is considerably more competitive and the French league is somewhat less so. On the Euroleague side, the results are mostly consistent with the ACB still more competitive than the Euroleague and the other leagues less so. The interesting results are that the Greek teams playing in Euroleague appear to be facing a much bigger jump in competition level than those playing in the Eurocup. My impression is that the Greek league is one of the more imbalanced leagues in Europe with the Athens based Olympiacos and Panathinaikos being much stronger than much of the rest of the league. Consequently those two teams have easier Greek league schedules than the teams that have to face them. Just as the Pacers and Heat have the easiest schedules in the Eastern Conference. In general the results seem to follow the change in point differentials teams see going from their domestic leagues to the international ones, which is again reassuring. So, the point of all this from my perspective is to have something of a strength of schedule adjustment for my draft model. My starting point after all of this analysis for the draft model comparing European players to NCAA by league is below, remembering that my overall analysis of college players jumping straight to Europe indicated an overall fall in production of -2 AWS per 40. Statistically speaking are those significant numbers given that the standard deviation for top one hundred prospects is just over 2 AWS points per 40. On the other hand other than Clint Capela and Jusf Nurkic there is a gap in the production of European prospects playing against grown men and the ones playing in college. But we'll see how it shakes out as I get the full model tested. I've been working on a couple of projects to compare the level of competition between different basketball leagues, including the NBA-Development League and an in the works project looking at Europe. Gathering the data for projects gave me the opportunity to take a preliminary look at the stats for the prospects in the up coming draft. The method I have been using to compare league competition levels utilizes the box score metric Alternative Win Score (AWS), one of a number of metrics that weights positive and negative contributions by a player recorded in the box score. A previous study by Neil Paine indicated that this metric was the best at predicting wins by teams with high turnover in personel, making it potentially useful for looking at draft prospects and comparing the effects of moving between leagues. In order to analyze the statistical production of draft prospects there are a couple of adjustments needed to make the stats comparable; adjusting for pace, competition level faced, age and random variation. The first two issues are of particular importance looking at potential draftees playing outside the NBA. As of today, the DraftExpress.com mock draft had two players currently in the D-League and six players from Europe. My analysis of the D-League and the higher levels of European basketball indicated that they represent a higher level of competition, so I developed a simple adjustment factor to account for that by boosting the AWS score based on the central tendencies of score movement by players moving between leagues. Conversely, both pro-European teams and the D-League play at a faster pace than college, so I adjusted their stats down to the NCAA pace. Age is a tremendous factor in the NBA draft. Players in numerous studies have been shown to have an "age curve," improving play generally until their mid to late twenties then declining in productivity. The increases in the eighteen to early twenties can be quite steep, so the same level of productivity in an eightteen year old is a better predictor of potential value than it would be in a twenty-two year old player. I did some preliminary work developing adjustments based on the central tendencies of prospects improvements, as measured by AWS, with the biggest boost coming from 18 to 19. This adjustent is preliminary, but I think gets it 80% of the way there and certainly improves the estimate of talent. The last adjustment is a mean reversion adjustment that is weighted as 150 minutes of average play against the player's minutes and actual production. This accounts for some of the random variance basketball stats will inevitably display, and temper over-reaction to small sample sizes. The effect is most pronounced currently for someone like PJ Hairston, who is playing very well in the D-League, but has only logged 160 minutes so far. A Swiss big man that you have probably never hear of, Clint Capela, came out second. He is playing some very high level ball against some pretty difficult competition. Slightly hurt by the reversion due to fewer minutes to date than most NCAA players. KJ Daniels is having a hell of a season. He's been a solid player but really upped his score so far this year. His two year average weighted to this year puts him as a late lottery pick. Noah Vonleh and Doug McDermott did well. Vonleh I expected, McDermott I did not. I wouldn't take McDermott this hight (see defense), but he's putting up numbers. Joel Embiid gets lowered a bit because he has played fewer minutes than many other players and is a smidge older than Parker. Andrew Wiggins falls to 26, the statistical production just isn't there, even allowing for age. The 'model' doesn't know the difference between Wiggins' athleticism and McDermott's. The first ten prospects scored very close together. In those cases scouting and athletic measures should become magnified in importance. Again I am not to the point of going into what 'projects' and what does not. For example, earlier I looked at transition verse non-transition points going from college to pro, here I am just taking the measures as presented. I just followed up with Celtics 2013 second round draft pick out of Colorado State Colton Iverson, who has been playing this year in Turkey for Besiktas in the Turkish League and Eurocup league. Iverson's stats are generally somewhat down from his last year in college, with rebounds per minute, scoring and true shooting all down and personal fouls and turnovers up. Fellow late second round pick and advanced stats darling Mike Muscala is playing in Spain, and the story is much the same. My immediate question was whether this statistical deterioration by both players is a typical effect a higher level of competition playing pro ball in Europe. Previuosly, I did a comparison of the NBA Development League (D-League) to the NCAA to compare the competition level and in particular to evaluate PJ Hairston, a former North Carolina player who has recently started playing in the D-League in hopes of getting drafter this summer. The method there revolved around comparing a player's score on a metric called Alternative Win Score in both leagues that he played, in that case, the NCAA and the D-League. There was a clear pattern of players showing a degradation in their production against D-League competition, especially when the slower college pace is taken into account. As a reference for the AWS scale I made this chart, as a rough idea what different AWS numbers per 40 minutes mean. Looking at play in Europe is a bit more difficult than the D-League, as there is no single European league. The league Bucks first round selection Giannis Antedekoumpo played in was a decidedly junior Greek league, the kind of which many young 'draft and stash' European prospects taken in the second round have the majority of their on court experience. For this comparison, I am using the seven larger European leagues tracked by DraftExpress.com. The level of play isn't exactly the same in the different European leagues used here, with the Spanish ACB and Euro-League being the best. However, it is relatively close, especially compared to the distance apparent between general NCAA competition and the European leagues. I looked at 29 NCAA players that went from the college game right over to Europe like Iverson and Musina concentrating on the last three years. The per 40 minutes stats for both college and European Leagues were pace adjusted to the NBA level, as I did in the D-League comparison. The median AWS fell by 2.1 points going from college over to the major European leagues. All of these players are coming out of college and still developing, so the difference in competition levels is probably understated slightly. All of the categories showed deterioration moving to the European pros. A good example of a player that falls fairly close to the central tendencies here is Kyle Singler, whose AWS per 40 fell from 6.6 his senior year at Duke, a solid starter, to role player numbers in the Spanish ACB and the Euroleague with an average AWS of 4.3 (It dipped again his first year in the NBA though is hovering between role and deep bench level this year). Another is Robbie Hummel, who put up an All-Star level 9.7 his senior year at Purdue and fell to a 6.8 Quality starter level in the ACB. (And is scoring a 4.5 role player level with the T-Wolves). For fans of the transitive property, I also tested movement between the D-League and European leaguesm finding a difference of -.88 moving from the D-League to Europe using 65 players going from Europe to the D-League or the other way around. Since the college players going to the D-League scored about -1.5 AWS lower, the total of those added difference are roughly in line with the college to Europe total difference. This one of those projects with a lot of data collection and calculations that ends up with a pretty simple answer and not one all that unexpected. But, still a necessary step since I plan to keep including European draft prospects in my Draft potential model. (And happily these findings follow my initial estimate closely). The stats and the commentariat all agree, the Phoenix Suns are most unexpectedly good team and the Brooklyn Nets are the most unexpectedly bad team. Recently over at Hickory-High, I looked at surprises in the Eastern and Western conference in terms of player production as measured by ASPM, box score based metric scaled like a plus/minus score. Here I am going to apply it to the whole team. In the table below I have the average of the projected ASPM score for returning players that had at least 160 minutes, the average actual ASPM to date this year, and the difference in standard deviations. Then a couple of columns that I think put change in ratings in perspective, the percent of the players in the comparison returning, the average age of those players and whether the team has a new coach. ASPM ASPM Diff (Std Dev) Percent Starters & Role Player Vets on Same Team Average of Age New Coach? In the table there are a couple interesting results. There has been a great deal of talk about the historic gap between the Eastern and Western conferences. The players in the West came in with a slightly higher average projected ASPM, but just slightly -.09 for the West and -.18 for the East. However, to date players in the West as a whole has been out performing their projections .58 points while the East players are under performing their projection -.26. The discrepancy gets even more pronounced when looking at average ASPM weighted by minutes played, indicating either that the Western teams have more star power and less 'flat' rosters or that the coaching desicions are better lined up with ASPM's measurements, or some combination. Really interesting here we see that Hornacek, who has coached the team most overperforming their stats, has played his veteran players with the least correlation to ASPM (though the correlation moves positive when rookies and back benchers are inclyded). On the other hand Portland shows the highest correlation, reflecting, in part, the differential in talent between the bench and starters even after this year's upgrade. Not only do thirteen teams have new coaches, on the other seventeen teams nearly 30% of the players included in the comparison changed teams, so 60% of the players in the comparison are in the first year with their coach, and that is not including rookies new to the league. A great deal of blame and credit gets heaped on head coaches in the NBA depending on how the team is doing. But it is a real question as to how much of it is justified. It is the job of the coach to put their players in positions to be effective, take the best shots available, know when to crash the glass, where to be positioned on defense. Zach Lowe at Grantland had a nice piece on the progress of Steve Clifford, the new Bobcats coach, in that regard. We can also see that, for example, the Phoenix Suns under Jeff Hornacek have increased the their expected points per shot (Xpps) from 1.o27 per shot last year to 1.057 this year, putting the team in a better position to score efficiently. However, one the things we know from examining player metrics over the years is that player performance is less consistent when players change teams and on teams that have high turnover in players have less consistent results. With the current CBA favoring shorter contracts and shorter coaching stint, it seems that player performance will be less predictable and the nuances of the game will be even more important for analytics. What Happens to the Celtics Back Court When Rondo Comes Back? With the start of December I can not help but turn my thoughts to when Rajon Rondo is going to return to the court and what it will mean for this Celtics team. For a while it has been projected that Rondo may return sometime later this month, which I think is the most likely at the end of the month. After a frentic November the Celts find themselves a win or two over the otherwise lowly Bucks away from respectabiliy, sitting at 7- 12 for a .368 winning percentage. Whether or not the team wants to make the playoffs they are a game and a half out in the underwhelming Eastern conference and a half game out of the Atlantic division. There are, I think, a couple of different questions we need to answer to estimate what Rondo's return might be for the team. For the purpose of this post I will be assuming a healthy return for Rondo allowing him to play at a comparable level to his preinjury production, which is, I think, likely but certainly not guaranteed. We also have to look at how good Rondo is, whose minutes he takes, and any affect he may have on his teammates and the line ups used. Before the season started I had a post that used some of the advanced one number player metrics to evaluate the Celtics roster and settled on comparing the wins above replacement each player would be worth assuming the player played 36 minutes a game for every game. The idea wasn't that I assumed any of the players would do that, just to scale their expected production on the same level. Rondo was projected to have the highest wins above replacement per 36 of any player on the Celtic roster. The before season projection used five different metrics to project player production, Wins Produced, ASPM, EZPM, xRAPM and Win Shares. Rondo's median projection was 10.5 wins above starting a replacement level Point Guard for 36 minutes a night. Of course, part of that equation is the production of a replacement level guard. So we need to look at exactly whose minutes a returning Rondo is taking and how productive they have been. One of the issues for Boston is that all of the player metrics agree that the guy Rondo is going to replace in the line up, Jordan Crawford, has been their best guard to date, and, in fact, probably their best player. Interestingly those same metrics projected Crawford at below replacement level before the season started, which leads to the question of how sustainable Crawford's current production is going forward. Notably, Crawford's usage has declined each year while his true shooting percentage and assist percentage have gone up each year. Though, in the shooting area, in particular, we should expect to see some regression, Crawford has proven that he deserves some time after Rondo comes back. The question is how to accomplish that and what backcourt combos to use to maximize production. That leads me to Courtney Lee, the Celtics Guard with the second most efficient production so far this year who has played the third most minutes. Lee has been close to what was expected of him with even better three point shooting, an important point in a backcourt that lacks stretch shooters. So far this year Brad Stevens has yet to start Courtney Lee, starting Jeff Green out of position and Avery Bradley instead. Bradley is a difficult player to value because of the disconnect between his defensive reputation and his offensive production. He has played better since being moved to his more natural Shooting Guard position, with a somewhat better TS% and fewer turn overs. But, Bradley does not have a starting NBA Shooting Guard shot and lacks consistent three point range. It is also not clear that he has the defensive impact of a Tony Allen and occasionally seems wear down. When Rondo comes back floor spacing in the starting backcourt will be even more of an issue. Rondo is a career 24% three point shooter and has only shot over thirty percent once in his career. (Even though I have an irrational belief that Rondo is going to come back with new found three point range based a vague memory of a report that he was working on them in rehab). Either Crawford or Lee should be on the court for the bulk of the time with Rondo to help with spacing. Given that a significant chunk of Crawford's newfound value is based on his increased assist percentage and more selfless play, he should take on the sixth man/back up point guard roll and Lee starts, if not necessarily finishes. Until Bradley finds a consitent jump shot he needs to be moved to the bench as a defensive energy guy. 'Cause nothin' beats a scatterplot, or six. (Update): After playing around with it a little there are some interesting differences by team. I am glad I kept that filter, the metrics all love how the Spurs and Hawks assigned time. Philly had the only negative slope I could find with Win Shares, meaning Win Shares thought Doug Collins was slightly more likely to play bad players than good.